The 13th century Romanesque fa�ade extends to the entablature and bears the coats of arms of the Farnese family . In the lunette above the main entrance there is a copy of the original marble statue of the Madonna and child by a 14th century sculptor now in the Museum of Sacred Art. The interior was completely modified in the 19th century . In the presbytery there is a noteworthy marble tabarnacle by a 15th century Florentine artist containing a Madonna and child in glazed terracotta by Giovanni della Robbia and a wood panel of The Guardian Angel by the artist from pomarance ,Nicol� Cercignani. In the nave the Holy Family by Maratta and the Madonna of the Redemption a 15th century fresco transferred to canvas attributed to Cenni di Francesco. The coats of arms of the city is the only decoration on this simple stone fa�ade. The interior, modified throughout the centuries, has a single nave and a wooden beamed ceiling . The high altar is surmounted by an ostentatious 18th century marble tabernacle containing the wood panel of the Madonna and child by a 15th century Tuscan artist. The presbytery displays four funeral monuments dedicated to illustrous members of the Guidi family including that of Monsignore Jacopo Guidi 1588 and Admiral Camillo di Jacopo Guidi 1719. The paintings exhibited above the altars are The Conception by G.B. Naldini 1585, the Nativity by Balducci, the Crucifixion by Cosimo Daddi 1602. The Chapel of the Holy Cross. This elegant little chapel was built by the Tedecinghi family in 1315 and was completely adorned with frescoes by Cenni di Francesco in 1410. The frescoes tell the story of the Virgin and Christ and the legend of the True Cross . Above the altar a canvas of the Crucifixion by an artist from San Gimignano Vincenzo Tamagni. 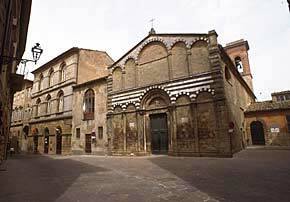 The church and the convent were built in 1445 by Michelozzi. The porticoed fa�ade contains two chapels displaying the glazed terracottas of Giovanni della Robbia depicting Saint Francis Giving the Rule to St. Louis of Toulouse and St. Elizabeth of Hungary; and the Last Judgement 1501. The interior has been partly restored to its original appearance . The high altar is flanked by two paintings ; The Annunciation by the 15th century Sienese artist Benvenuto di Giovanni and Madonna and child with saints by Domenico di Michelino. The adjacent chapel displays The Immaculate Conception by Santi di Tito and the statues of St. Francis and Saint Girolomo in glazed terracotta , attributed to Giovanni Gonmelli known as the Blind man from Gambassi. It is believed that the church was consecrated in 1120 by Pope Callistus II. A 16th century portico embellishes the exterior while the interior is extremely simple with a single nave and a wooden beamed ceiling. The church conserves a wooden painted 12th century cross by a Tuscan artist and two paintings of Saints Attinea and Greciniana by Cosimo Daddi. On the right wall from the altar there is a valuable 15th century marble tabernacle recently collocated in the church. 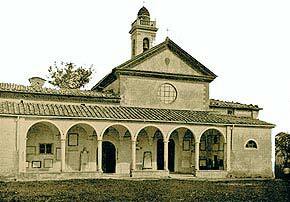 This simple convent church with a single nave was built at the request of Raffaello Maffei on the sight where Pope Linus residence once stood. The high altar is surmounted by a wood panel of the Virgin and saints by Francesco Curradi and the nave displays The Birth of the Virgin by Cesare Dandini (first half of the 17th century), The Visitation of Elizabeth by Cosimo Daddi 1619. 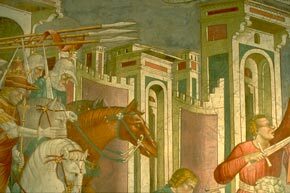 The presbytery houses the funeral monument of Raffaello Maffei executed by an artist from Fiesole, Silvio Cosini in 1522.